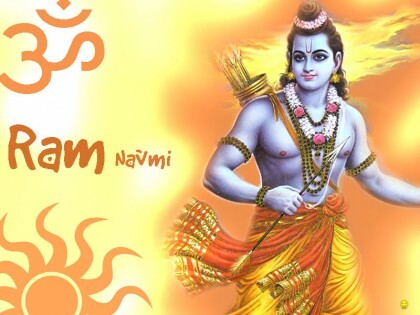 Ramnavmi celebrates the birth of Rama, hero of the epic Ramayana, who was born on the ninth day (navami) of the waxing moon in the month of Chaitra. Lord Rama was the King of Ayodhya. He was the ideal son, the perfect King, the best of men. So virtuous that he became god. In him people witnessed the seventh incarnation of Vishnu, born on earth to destroy the demon Ravana. Swami Sivananda writes, ‘He was the Lord of the mind and the senses. He was a sage in counsel, kind and sweet in speech, and most courteous and handsome in appearance. He was master of all the divine weapons, and a great warrior. He was brave and valiant, yet gentle and modest. Ever devoted to the good of his kingdom and his subjects, he was a defender of the weak and protector of the righteous. Endowed with numerous wondrous powers of the mind, he was well versed in all sciences–in military science as well as the science of the Self. When Rama was King, his subjects enjoyed heaven on earth. Ramrajya, the rule of Rama is now synonymous with an ideal state. As loved today as he was in Ayodhya, Ram remains one of the most popular Hindu deities. At mid-day, the time Rama’s birth, all Ram temples across India, will begin special poojas with chantings from the Vedas and readings from the Ramayana. But the largest celebrations will be in Ayodhya, the birthplace of Ram. A rath yatra is the highlight of the celebrations here. A procession with a chariot, rath, moves through the city carrying actors dressed as Ram, Sita, Laxman and Hanuman who enact parts of the Ramayan while crowds line the streets to watch. 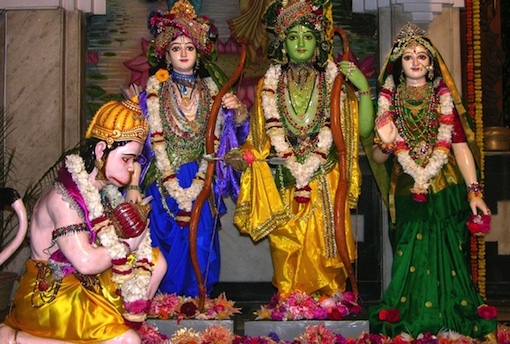 In the south of India, the day is also celebrated as the wedding anniversary of Sri Rama and his consort Sita. Sitarama Kalyanam, the ceremonial wedding ceremony of the celestial couple is held at temples throughout region. It is interesting to note that Ramnavmi has many elements of Sun Worship. Ram was a Raghuvamshi, a descendant of the Sun Dynasty. Ramnavami is celebrated at the beginning of summer when the sun is moving higher up in the skies( of the Norhern Hemisphere). Ram was born at noon, the time when the sun shines most brilliantly .On Ramnavami the prayers start not with an invocation to Rama but to Surya, the sun. Rama is also known as Raghunatha, Raghupati, and has other names which begin with the prefix Raghu meaning sun. The syllable Ra is used to describe the sun and brilliance in many languages. In Sanskrit, Ravi and Ravindra mean Sun. The ancient Egyptians termed the sun as Amon Ra or simply ‘Ra’. And in Latin the syllable Ra is used to connote light as in radiance. Could it be that Valmiki modelled his Rama on the mighty Sun? Was Ram a personification of the Sun? Or, did Ram simply embody the qualities of the Sun? I wonder. Rama at 12 noon, Krishna at 12 midnight. And the two were so different in temperament. One an idealist to fault, one a practical man; one a one-woman man, one who would please whoever desired his love; one a godly man, one a humanly god. Both avatars of the same protector. Fascinating, is it not? Yes Smita 🙂 . One was man as God and the other was God as man . I think I prefer god as man with his very human qualities .